British playwright Beau Hopkins wrote The River and the Mountain - the first Ugandan-produced play to deal with the theme of homosexuality. 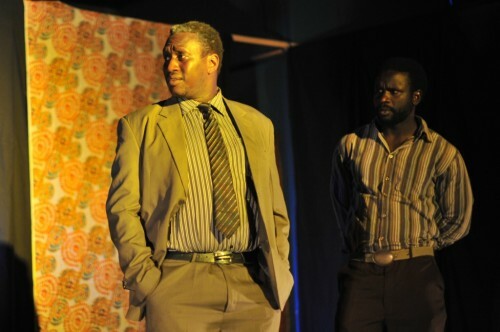 The controversial show, which premiered in Kampala in 2012, led to charges against and eventual deportation of producer David Cecil. The River and the Mountain will make its US debut – and its first showing outside of Uganda – in a series of staged readings in the DC/Baltimore area, including a free staged reading this Saturday night at Artisphere. I recently spoke with Hopkins about the project and the current political climate in Uganda. Joanna Castle Miller: Tell me a little about what led you to write this piece. Beau Hopkins: I met (producer) David Cecil shortly after I arrived in Uganda in April of last year. And he introduced me to a theater company that suggested an interesting topic: the issue of homosexuality. It was something over which a blanket silence had descended that was politically motivated. And in their view, it was important to rupture that silence. Summertime in the city–the daylight lasts longer, the outfits get shorter and the city has so many things to offer you outdoors. 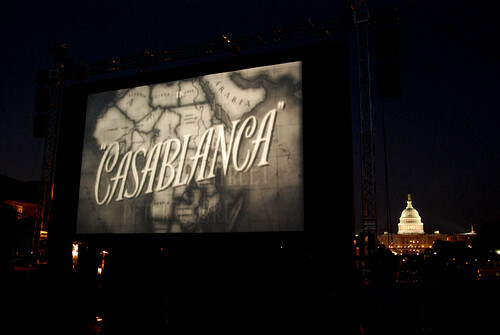 We’ve rounded up the outdoor movies in the DC area and put them into one comprehensive guide. Break out the popcorn and blankets and get ready to see what films are rolling this summer. Follow @SOTGinDC for updates and more information. Thursday, July 12: O Brother, Where Art Thou? Follow @CapitolRvrFront for more information. ARLNOW is reporting that the BBT branch in Rosslyn was robbed this afternoon by two men, one of them supposedly armed with a gun. 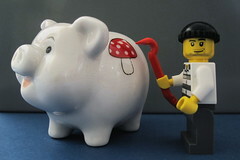 The men fled the scene and dropped the money when a marking dye exploded in the bag as they passed the Holiday Inn parking lot. Hey Rosslyn, Georgetown, Dupont: notice anything different transit-wise? 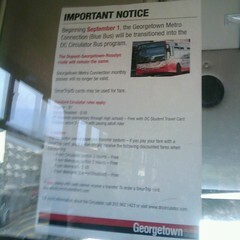 As of today, the Georgetown Metro Connection (AKA the “Blue Bus”) has switched over to the DC Circulator (AKA the “Red Bus”). The route and stops are the same, but the buses are different, and now you can use Smartrip. And the really good news is that most of the old Blue Bus drivers have also been moved over to driving Circulators, so they haven’t lost their jobs in the switchover. Full disclosure: I am a fan of District Taco. I am part of the NMS crew that make up the Mexican food cart’s biggest fans. We rallied for them when they got booted from Rosslyn. I am writing this post with a District Taco lunch in my stomach. But don’t worry, what I’m about to say is something that is good for everyone if we can pull it off. District Taco currently has around 1,800 followers on Twitter. They want to up that number significantly- say to about 10,000. A very daunting task. But the rewards? Free tacos for a day. That’s right. Free tacos, chips & salsa for a day if District Tacos gain the 8,000+ followers it needs to reach 10K. Now who doesn’t love tacos? Who doesn’t love free tacos? And for those that have had the pleasure to have dined there, who doesn’t love a District Taco? So round up your Tweeps- District Taco is looking for some followers and if you decided to help them out you could be enjoying free tacos. After years of scouring, the DDOT historians have posted some fantastic photos of our beloved city from the 1940s thru the 1960s to their Flickr account. The set features cityscapes from all over the district, including an awesome shot from an open air parking lot on H Street NE, a Harlem-esque looking F & 13th Street, and Tenley Circle with streetcar tracks. My favorite pic is the shot of Rosslyn looking over the Key Bridge to DC taken in 1945. It’s amazing to think of the now skyscraper filled neighborhood as only having two and three storied buildings. Some may remember one of last remaining relics of that era, Tom Sarris Orleans House, which tragically closed in 2008. That place was definitely a DC insiders go to. It’s been a fun (i.e. not fun) morning on Metro, with backups from multiple sick customers on Orange/Blue and Green/Yellow Lines at Rosslyn and L’Enfant Plaza, broken escalators at Dupont Circle, and the standard parade of nonworking air conditioners. Update: Oh, and a switch malfunction at Rosslyn. And a family stuck in the Cleveland Park Metro elevator. Update, 6PM: And an escalator fire at Dupont! Today is the gift that keeps on giving. And by gift we mean not a gift. “We need a doctor,” came the yell. Some of the last words you want to hear on Metro; they indicate that somewhere on the train, someone may be suffering or dying — and of more callous concern, that WMATA’s “Sick Customer” policy goes into effect, stopping the train and triggering cascading delays down the line. It was Wednesday evening, rush hour. I was at Rosslyn, on the Orange Line to Vienna. The operator announced over the train P.A. that he would be leaving the cab to attend to a sick customer, emergency services had been summoned, and that we would be holding at Rosslyn indefinitely. 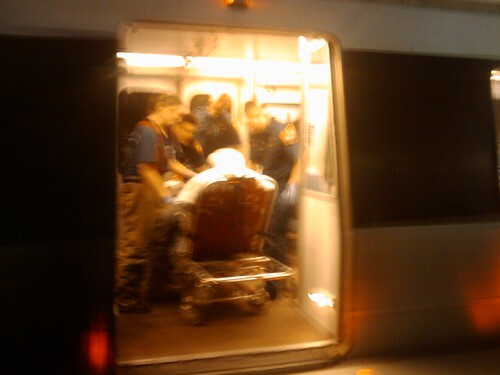 In the second car of the train, an elderly man in a suit had collapsed from what appeared to be a heart attack, and lay on the floor, unmoving, a doctor examining him while another passenger checked his cellphone for emergency contacts. Tags: emergency, orange line, Rosslyn, sick customer, WMATA, WTF?! Metro announced today that two emergency response exercises will be happening Sunday and Monday next week, so here’s a heads up not to panic when you see “numerous police, fire and emergency response vehicles, first responders and volunteer ‘victims’” in the middle of the night this weekend. One drill will simulate an explosion on a Metro train in the tunnel between Rosslyn and Foggy Bottom at 1 AM on Sunday morning, and trains will single-track around the ‘accident’ from 11 PM Saturday night to closing at 3 AM on Sunday morning. The second drill, which will simulate a Metrobus explosion with multiple injuries, will happen on Monday morning at 10 AM at the RFK Parking lot. 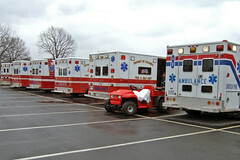 These drills are meant to test Metro emergency management and regional emergency response crews. Here’s hoping they pass! Perhaps you had enough of water over the weekend? If not, get thee to the DOME in Rosslyn at 7 p.m. tonight for a screening of Liquid Assets (see the trailer). This third film in a green series sponsored by Arlingtonians for a Clean Environment promises to share the true importance of systems of water, wastewater, and stormwater treatment that we often take for granted. I understand — at first glance it sounds a bit dry, no pun intended, but it can be fascinating to find out how things work. How does that water get from the river to your faucet anyway? 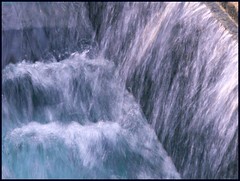 This film talks about what goes on far below our feet — and how to keep that clean water flowing.